The Rolling Stones are to perform in London's Hyde Park for the first time since a legendary free concert for an estimated 250,000 people in 1969. The outdoor gig will take place on 6 July, a week after the group's first appearance at the Glastonbury festival. 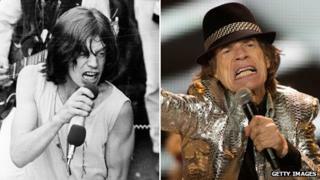 The rock legends famously played in the park just two days after death of guitarist Brian Jones in July 1969. "It seems like yesterday," guitarist Keith Richards told the BBC. "It's going to be a great summer, man." Media captionMick Jagger: "I will keep the poetry to a minimum"
He added: "All the gigs we haven't done or wanted to redo are popping up." At the first Hyde Park gig, Mick Jagger wore a white dress on stage and read a Percy Bysshe Shelley poem dedicated to Jones. Thousands of butterflies were then released into the air. "I'll try and keep the poetry to a minimum," Sir Mick told the BBC's Colin Paterson about their return. He did reveal that he still owns the dress, adding: "I can still just about get into the zippers." Unlike in 1969, this year's show will not be free - but ticket prices have not been announced. The group angered some fans when they charged up to £406 for shows at the O2 arena last year. The Hyde Park show - part of Barclaycard Presents British Summer Time Hyde Park - will come a week after the Stones headline the Pyramid Stage at Glastonbury. Sir Mick said he would phone U2 singer Bono for advice following the Irish band's 2011 performance. "'Don't do it!' might be his advice, but it's a bit late for that," Sir Mick joked. "It is quite a difficult gig," he added. "U2 had terrible weather and that didn't help. You have to learn from their experiences." Bono later said the band gave a disappointing performance at the festival because they were "a bit freaked out" by the conditions and the singer wore the "wrong shoes" for the stage. The Stones have also announced a North American tour, beginning in May, but with more recovery time between gigs than in previous years. "You gotta pace yourself," the 69-year-old singer said. "We have enough time before we come back to England, so we'll be well recovered." But he said the group had no current plans to tour the rest of the world. They will be supported in Hyde Park in July by The Vaccines, The Temper Trap and Gary Clark Jr.
Video Did Rolling Stones reunion work? Rolling Stones: What is a fair price for a concert ticket?